China aims to break the high-speed rail world record in a trial run next year, industry sources said on Tuesday. An experimental train - under development by CSR Corp Limited for test but not operational purposes - will "try to break the 574.8-km/h record" set by France's TGV (Train Grande Vitesse, or high-speed train) in April 2007, CSR sources said at the 7th World Congress on High Speed Rail in Beijing on Tuesday. On Dec 3, a high-speed passenger train manufactured by CSR set an operating speed record of 486.1 km/h on a test run on the Beijing-Shanghai line. The sources did not elaborate on the exact date the test will be carried out. As China's high-speed trains are running faster, its ambition to tap the world's high-speed railway market is also speeding up. A railway linking Vientiane, capital of Laos, with the Laos-China border, which China will help to build, may see construction start in 2012, Somsavat Lengsavad, standing deputy prime minister of Laos, said on Tuesday. The railway is part of a proposed high-speed rail network linking China and Singapore via Laos, Thailand and Malaysia. The media earlier quoted the transport ministry in Laos as saying that China has agreed to provide loans for the construction of the railway. A feasibility study is being carried out and it is expected that the railway will take four years to complete, Somsavat Lengsavad said. Sources with the Ministry of Railways said that trains on that line will run at a speed of 200 km/h. 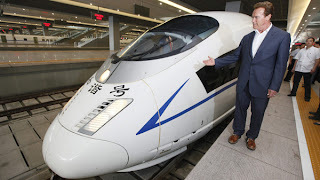 Suthep Thaugsuban, vice-prime minister of Thailand, also said at the congress that Thailand's parliament approved a framework of negotiations between Thailand and China to construct a high-speed railway in the country. This will be part of the China-Singapore rail network via Laos. The railway will greatly enhance mobility in Southeast Asia and boost economic development in Thailand, he said. The proposed rail network will better connect China to Southeast Asian nations. A 1,920-km rail line from Kunming, capital of Yunnan province, to Yangon, Myanmar's largest city, is expected to start construction soon, while another rail link between southwestern China and Cambodia is also under discussion, earlier reports said. China signed eight memorandums and agreements on railway cooperation with eight countries, including Bulgaria and Turkey, during the congress. China now leads the world with a high-speed rail network of 7,531 km, and thousands of kilometers of high-speed railways are under construction, said Minister of Railways Liu Zhijun. The country aims to expand its high-speed rail network to 13,000 km by 2012, and to 16,000 km by 2020, he said. Globally, nearly 25,000-km of high-speed rail tracks have been laid in 17 countries and regions, including Japan, France, Germany, Italy, Spain, Belgium, the Netherlands, Sweden, Britain and South Korea.